A South Korean woman being held captive by Taliban militants along with 21 of her fellow aid workers has made a desperate plea for help in an exclusive telephone interview with CBS News. "We are in a very difficult time. Please help us," said the woman, who gave her name as Yo Cyun-ju. "We are all pleading for you to help us get out of here as soon as possible… Really, we beg you." Yo, who spoke to CBS News on Wednesday night after an interview was arranged with a Taliban commander, sounded weak as she spoke for about three-minutes in Korean and an Afghan dialect of Farsi. "All of us are sick and in very bad condition," she said. Yo beseeched the South Korean government and the international community to make a deal with the Taliban to win their release. She said the hostages were being held in two groups — she was with 17 other women, and the men were being held separately. "We are in a dreadful condition," she said. She went on to describe her captivity as a "very difficult life every day", and "a very exhausting situation". The interview was the first known contact with any of the South Koreans being held by the Taliban in Afghanistan. A senior Taliban leader in the Ghazni province, contacted by CBS News Thursday, refuted Yo's claim that many of the hostages were unwell. He said only one of the male captives was sick, and none of the women was in poor physical condition. Mullah Mohammed Sabir, the Taliban's governor for Ghazni — not recognized by Afghanistan's government, which has its own governor in the province — said the group had provided a doctor for the ill man and he was also being looked after by several of his fellow hostages who have medical training. Sabir told CBS News that the last deadline set by the Taliban for the Afghan government to release prisoners in exchange for the hostages had passed before dawn Thursday morning, but no new deadline was set. He said the fate of the hostages was dependent on negotiations being held between the militant group and Afghan and South Korean officials. According to Sabir, two Taliban members from Ghazni, Abdul salam and Mulvi Abdullah, were conducting the negotiations with officials by phone. No face-to-face contact had been made, he said. A top South Korean envoy headed to Afghanistan on Thursday, scrambling to save the 22 of his country's citizens still held captive. Militants killed one hostage Friday, leaving his body to be discovered by police in Ghazni province. Yo told CBS News she was unaware of any of the men being killed, due to the separation of men and women. After conflicting reports Wednesday from Western and Afghan officials that possibly eight of the other hostages had been released, South Korean presidential spokesman Chun Ho-sun said the 22 were still believed held but not suffering from health problems. An Afghan police chief ruled out Thursday using force to free the others and said that the Afghan negotiators were speaking with the Taliban over the phone, hoping to secure their release. On Wednesday, authorities found the bullet-riddled body of 42-year-old Bae Hyung-kyu in Qarabagh district of Ghazni province where the South Koreans were abducted July 19. The killing sparked outrage in South Korea, where the envoy warned that those responsible would be held accountable. South Korean President Roh Moo-hyun spoke Thursday with his Afghan counterpart Hamid Karzai and they agreed to cooperate for the safety of the captives and their quick release, Roh's office said. Wednesday's casualty, Bae, was a founder of the Saemmul Presbyterian Church and led its volunteer work in Afghanistan. He was found with 10 bullet holes in his head, chest and stomach, said Abdul Rahman, a police officer. Another Afghan police official, who asked not to be identified because of the sensitivity of the situation, said militants told him the hostage was sick and couldn't walk and was therefore shot. South Korean church officials said Bae was killed on his birthday Wednesday. An official at the South Korean Embassy in Kabul said officials were making arrangements to repatriate the body on a flight from Ghazni. The kidnappers "will be held accountable for taking the life of a Korean citizen," said Baek Jong-chun, South Korea's chief presidential secretary for security affairs. He spoke to media before departing for Afghanistan to consult with top Afghan officials on how to secure the release of the remaining captives. "We will not use force against the militants to free the hostages," Ghazni police chief Ali Shah Ahmadzai said. "The best way in this case is dialogue." Ahmadzai said he was hopeful about reaching "some sort of deal for the release of six up to eight people" later Thursday, without giving an explanation for his optimism. South Korean presidential spokesman Chun Ho-sun said Seoul was aware of the Taliban's current demands but declined to specify them. Qari Yousef Ahmadi, a purported Taliban spokesman said Thursday that all 22 hostages were fine but claimed that Afghan authorities were not allowing South Korean officials to negotiate directly with the militants. "Kabul officials asked us to give them more time," Ahmadi said, speaking by phone from an undisclosed location. "The Taliban are not asking for money. We just want to exchange our prisoners for Korean hostages ... When they release the Taliban we will release the hostages." 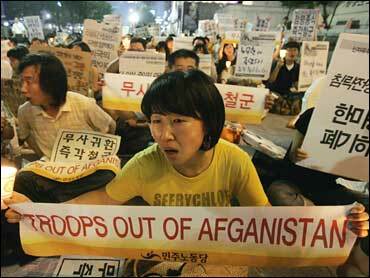 Seoul repeated its call that no rescue mission be launched that could endanger the captives further. Marajudin Pathan, the governor of Ghazni province, said militants have given a list of eight Taliban prisoners who they want released in exchange for eight Koreans. However, Khwaja Mohammad Sidiqi, a local police chief in Qarabagh, said that negotiations with the captors are difficult, because their demands are unclear. "One says let's exchange them for my relative, the others say let's release the women and yet another wants a deal for money," Sidiqi said. "They have got problems among themselves." An Afghan official involved in the negotiations earlier said a large sum of money would be paid to free eight of the hostages. The official also spoke on condition he not be identified, citing the matter's sensitivity. No other officials would confirm this account. The South Koreans, including 18 women, were kidnapped while on a bus trip through Ghazni province on the Kabul-Kandahar highway, Afghanistan's main thoroughfare. Because of a recent spike in kidnappings of foreigners — including an attempt against a Danish citizen Wednesday — Afghan police announced that foreigners were no longer allowed to leave the Afghan capital without their permission.